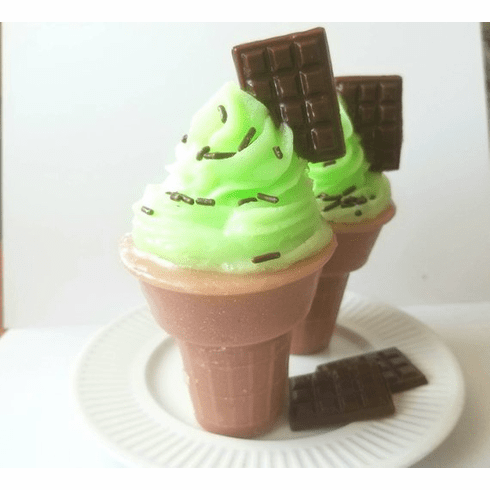 This cute ice cream cone soap is life-sized and looks like a real ice cream cone. You can fool anyone with this! Plus, it is made with 100% vegetable glycerin soap that is SLS and detergent-free making it an excellent hypoallergenic soap for children (and adults) of all ages. Deliciously scented with a chocolate mint fragrance, adorned with chocolate sprinkles and a chocolate confetti cone. Comes wrapped in a clear cello bag, a bow, and a scallop cardstock tag. Weighs approximately 7 oz.